Like many veterans, Harry Stone was disinclined to talk about his Vietnam experiences, except in the sparest detail. Consequently, the fact he rebuffed an invitation to speak at the upcoming dedication of a new memorial on Veterans’ Day came as no surprise to the sponsors. With the event still more than a month off, Ted Satterfield, editor and proprietor of the Valley News, had already lined up Walt Dodd (who had gone ashore at Normandy) to represent the World War II vets and young Jack McCaskill (wounded in the Gulf War) to stand in for the newest generation. Now Satterfield trained his sights on Harry. Everyone in Mercerville knew Harry had served, and it struck Ted that the former Marine would be a perfect candidate to say a few words after Mayor Buzbee delivered his remarks. Although two boys (sadly, they were first cousins) from Monroe High School had been killed early in the war, Harry, who had come east from California, apparently was the only Vietnam vet in the upper valley. From time to time cyclists and runners spotted Harry jogging along the river. Everyone agreed; for a man his age he was lean and fit. He often sported a crimson ball cap with the letters “USMC” stitched in yellow across the front, and the tattoo on his right forearm--Semper Fi-- caught the attention of runners who stretched, as he did, at the start of the trail. The tattoo, however, competed for their attention with a vivid scar that crossed his arm just below the elbow, perhaps, they suspected, the stigmata left by some jungle battle. Once a Marine always a Marine--that’s what they said. On an unseasonably warm September day soon after, Ronnie sauntered into Valley Toyota. Early afternoon sun gushed through the tall windows. Ronnie scoffed up one of the crullers the dealership put out for its customers and, munching that pastry, he wandered about for a time admiring cars on the showroom floor. Since he was really there hoping to meet Harry Stone, when he sighted Harry seeing off a customer, Ronnie trailed the salesman to his office. “I thought maybe your folks were thinking of getting you a car, maybe that used Corolla, before you go back to school,” Harry said. Seated behind a utilitarian metal desk, Harry did not invite Ronnie to take a chair. “No sir, I’m off this semester. I’m interning over at the News for Mr. Satterfield. Mostly sports. Sort of a utility infielder, you might say.” Harry offered an accommodating smile. “I even do the obits,” Ronnie added. Ronnie took his internship at the paper seriously--very seriously. Intent on honing his reportorial skills, like a spy in training, he let his eyes rove about the office cubicle assigned to Valley Toyota’s top salesman. Framed awards and plaques attested to Harry’s years of “devoted service.” The printed certificates all seemed pretty much the same--only the year changed from one to another. Ronnie catalogued a wall calendar, auto brochures, papers, pencils, order forms--all items standard in such a place. No family photos though--Harry had never married and lived with his brindle-colored bulldog in a modest bungalow on the edge of town. “Isn’t that a picture of the Vietnam Memorial? In Washington?” Ronnie asked. Nicely framed, but not prominently displayed, the black and white photo hung in a corner behind Harry’s desk. “Pencil rubbings from the Wall. Names of men who perished in Vietnam. We lost a lot of good people in that war.” Ronnie assumed a sober demeanor; he’d rarely, if ever, heard anyone use the word perish in conversation. As Ronnie navigated the show room floor crowded with vehicles, an inspiration flashed through his mind. Hank Gelbard, the service manager, had worked at Valley Toyota for years, probably longer than anyone there. On top of that, Gelbard lived next door to Ronnie’s parents and played cribbage with Ronnie’s dad. If anyone could give him some leads for his story, Gelbard was the man. Ronnie found his way out to the service department and leaned through Gelbard’s office door. “Sure was. It had to have been in ‘70; he’d recently come out of the service. If memory serves, moved here from the West Coast somewhere. Started out washing and parking cars. I was a mechanic in those days. Still Valley Motors; we changed the name later on. We were just getting off the ground. “Did he talk about what he went through, in Vietnam?” Ronnie extracted a pocket notebook from his shirt, intent on jotting down Gelbard’s words. “I guess it was too painful,” Ronnie said. Harry parked the old Toyota in front of his detached garage, picked up the Valley News lying in the driveway, and intercepted a skittering dry oak leaf. An American flag flanked the painted front steps on one side and a Marine Corps flag, with the Corps emblem (eagle, globe, and anchor) in yellow and gray on a scarlet field, flanked the other. The house shone with fresh paint, eggshell white, with gray trim and a gray roof. Harry had cleaned out the gutters a few days before. Sharp lines, precision--everything in order, like base housing at Pendleton. Here and there buff-colored spots afflicted the marine green lawn. Not much he could do, the grass had set about its autumnal rite of dying off. Harry stepped onto the porch, examined two pots of always thirsty red geraniums, pulled open the screen door, and went into the house. He returned immediately with a watering can, tended the plants, then went back in the house and straight to the little kitchen. He crouched in front of the refrigerator and discovered he was out of beer. He had hoped to have a cold one. In the living room, Harry kicked off his shoes, wind milled his arms, and lolled back in a Naugahyde recliner, looking indifferently at the blank television screen. Another day, another dollar--wasn’t that what people said? Nearly twenty years convincing customers they needed a new car, nearly twenty years letting them think they were bargaining with him--not what he’d planned, certainly not what he’d hoped for. But, all things considered, it could be worse. People at work liked him, he’d paid off his mortgage, he held a nice stock portfolio, he managed a trip to a Nevada “ranch” once or twice a year, he owned an up-to-date computer--hell, yes, it could be worse. Those thoughts freshly minted, Harry chuckled in a self-derisive way. He was kidding himself. The Veterans’ Day dedication had set it all in motion again. Harry carried an emotional burden, a burden from which he had struggled to free himself for years. Quiescent for a time, the emotions had reasserted themselves, weighed in on him with increasing power and frequency. He sought to suppress them, but they were always there. He heard scratching at the back door. He’d forgotten all about PX; she probably wanted to eat. He went back to the kitchen, filled her dish, and let her in. Ignoring the dry food, she trotted to him, wagging her stubby tail and quivering with dog happiness at seeing him. The third English bull dog he had owned; he wished PX wouldn’t slobber so much, but then it went with the bulldog territory. He rubbed her ears, and she followed him back to his recliner and lay down at his side as she always did. Happy dog, happy man. It sounded good, an idyll of contentment. If only it were so. Instead, in his mind, once again Harry, wet with perspiration, stepped into a fetid black-green jungle, each minute drawn irresistibly further and further in. It was both a waking dream and a nocturnal dream that repeatedly woke him. Sometimes he worried for his sanity. Harry flipped on the television set, surfed a half dozen channels, came across nothing that grabbed his attention, and decided to go into the second bedroom he used as an office. A social creature, PX trailed behind. Harry settled into his swivel chair and turned on the computer. Rather than checking his e-mail, he allowed his thoughts to travel; they almost always delivered him to the same destinations. Harry spent a great deal of time in this office--he kept the memories there. From a photo directly above his desk, one with Harry barely visible on the third riser, a company of grim-faced Marine recruits looked straight at the camera. Delta Company, Marine Corps Recruit Depot, San Diego. March 1969. 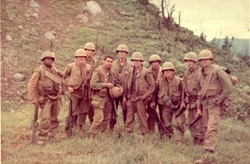 Tough guys; ready to go--Semper Fi. A mahogany framed shadow box, resplendent with ribbons and medals, hung next to the window on his right. His eyes swept across the awards: Silver Star, Navy and Marine Corps Medal, Purple Heart, Navy and Marine Corps Commendation Medal, Navy and Marine Corps Good Conduct Medal, Vietnam Service Medal, Republic of Vietnam Gallantry Medal, and Expert Rifleman. He had kept the display in the dealership for a while, but people asked too many questions, questions he just didn’t want to deal with. Immediately below the shadow box Harry exhibited a collage of three photos; one was of his mother, Evelyn, as a young woman (he’d had it made from an old snapshot). Another was a grainy picture of a father he barely remembered (he died in the snow at Korea’s Chosen Reservoir). The third photo was of his older brother, Ben, then a Marine somewhere in Vietnam--the place where he had been killed, an old-timer all of twenty-three. Hands on hips and surrounded by sand bags piled high, like the walls of a medieval fortress, the towheaded first lieutenant gave his photographer a big grin. Amazing, how much Harry and Ben looked alike, the eyes, the set of the mouth. But, of course, death had placed its seal on him; unlike Harry, Ben had never grown older. Harry pivoted in his chair and, as he often did, gazed at his family members--all of them gone. He shook his head. Sad. Damn sad. Already suffering with emphysema and a weak heart, Harry’s mother had declined quickly after they heard about Ben. She had pleaded with Harry not to enlist, but a sense of obligation and an insistent urge toward emulation of the father and brother who had served before him propelled him to the recruiting office. Still in her fifties, his mother suffered a heart attack and died three weeks before he climbed onto the bus for boot camp. And Ben. Had there been an award for exemplary older brothers, crowned with a laurel wreath if one had been handy, Ben would have carried it away hands down. Harry had tried to fit himself into the mold that shaped his older brother, but he considered the product that emerged to be flawed. When Ben had the lead in the school musical, Harry sang in the chorus; when Ben made first team all conference, Harry counted himself fortunate to get into a game; and when Ben won acceptance at half a dozen universities, Harry headed off to the local community college. Not for want of trying, Harry never quite measured up. It seemed a recipe for envy, but, in fact, it hadn’t turned out that way--not at all. Ben had been so decent, so supportive of Harry and their mother, so generous with his time and money. He always stood by him when Harry ran into problems. Never envious--quite the contrary--Harry idolized his brother and from an early age lived vicariously through him. You could only love the guy. At times, Harry imagined he was Ben; not really, he told himself, it was just a turn of phrase. But, yes, really--he did. Ben’s achievements became his own; Ben’s disappointments became his own. And the bullet that penetrated Ben’s heart might just as well have penetrated his own. In a sense he died with Ben and in a sense Ben lived on through him. Now came this pressure to appear on Veterans’ Day. Harry had always worried something like this would happen someday, surprised it hadn’t come sooner. He had to think like Ben. How would Ben have handled the request to speak at the dedication? Ben had been a modest person, always giving credit to others. He’d been through so much, but he would never have boasted--or complained--of it publicly. Instead, he would likely have spoken in behalf of those who served, in behalf of those with their names on the Wall in Washington. People pushed these dead heroes out of mind; people needed to be reminded. But, Harry knew he wasn’t Ben and his circumstance was substantially different. Harry mulled the editor’s invitation, confident he hadn’t heard the last of it. And there was the kid from the paper. He’d been asking Gelbard questions. Harry plunged into an emotional maelstrom, one that had periodically sucked him down for more than twenty years. Ben would know what to do. Oh, Ben . . . the war, the God damned war . . . In the early 1980s, Harry had avidly followed the dispute surrounding the character and artistic merit of the Vietnam Veterans’ Memorial in Washington. But, over time, he realized the controversy had dwindled and the Wall had become one of the most visited monuments in Washington, polished black in a city mostly dull white--and the one most likely to break your heart. People offered to make them for you, but Harry had created the Wall rubbings himself. It had taken a long time before he could bring himself to take the trip, but two years earlier he drove to Washington and, wearing an old camouflage jacket, stood at the Wall with tears streaming down his face. He was not alone. Even the skylarking teenagers trooping in from their centipede-like columns of orange buses and all but the most slow-witted tourists in shorts fell quiet, speaking in low, reverential tones. That’s how it should be, Harry thought--a place for remembrance, a place for respect, a place for reflection. Like Ben, Harry had never believed in lost causes, in pointless heroics. But, Harry resisted the inclination to surrender himself to a denunciation of the war, despite the siren logic that enticed him to do so. He could not bring himself to believe the thousands and thousands of names on those Wall panels constituted a collective summary of useless sacrifice. The deaths had to have meaning, they had to. Harry felt an urge to ask a biker leaning against the wall, head down, his hand covering a name, what meaning there might be. Harry yearned for solace, but could not bring himself to approach that man or any other. Instead, he concentrated on locating the names. With the aid of a directory, Harry found Ben’s name first--Benjamin Hamilton Stone. He let his fingers caress the computer incised letters, their edges neat, but not sharp. Harry discovered two other Stones; could they have been relatives? He mingled with dozens, perhaps hundreds, of other veterans and family members who searched that day. They didn’t speak much; there was no need. One man gently placed a hand on Harry’s shoulder, one vet to another. People came and people left, like a repetitive changing of the guard, in its own way one every bit as solemn as that at the Tomb of the Unknowns across the river in Arlington. One by one, he located four more names and created pencil rubbings: Ted Bushnell, Roberto Cuadrado, Dexter Hardwick, and Oliver Krebs. He borrowed a ladder to reach Ollie Krebs’ name. Other names, several other names, came to mind he had intended to trace, but he could go no further, simply too torn apart, too drained to do so. His sense of loss vied with his sense of guilt; individually the twin emotions toyed with him; together they crushed him. Apart from his brother, all these men had left the bus with him in San Diego, had begun basic training with him. They had all died in Khe Sanh or Hue, most in unremembered ways. Now they were nothing but names set in slabs of polished black granite, nothing but bones and fillings in the ground. They died; he lived. Why them? Why Ben? Harry sold cars, drank beer, screwed Nevada whores, watched television, and teased his dog. Harry considered the veterans gathered before the Wall. How many bore the same burden of guilt, the same emotional scar, he did? He had no idea; he only knew his own was intense. It was irrational, he knew it was irrational. Yet, the guilt clung to him like the leeches that had tormented young soldiers and Marines in the paddies and jungles of Vietnam. Harry knew Ben would have gone, would have wanted to honor his fallen comrades. Harry put down the phone, went into the kitchen, and pried the cap off a bottle of San Miguel beer. He took a gurgling swallow, glanced at PX snoring on the living room rug, and slumped into his recliner. Why couldn’t they leave him alone? Why stir it all up again? Could they possibly understand how ripped up he felt--still alive and the others all dead at eighteen or nineteen. The years slid by, but the insoluble torment lingered, sometimes quiescent, but always there, embedded in his gut, stitched in his heart. He chugged the rest of his beer, then placed the bottle on a side table, his eyes fixed on the label. San Miguel, a lot of the boys drank it when they were over there--came from the Philippines. Harry closed his eyes and raised his hands to his face. Ben, Ollie, Dex, . . . They asserted their insubstantial selves, like dead soldiers marching across the screen while the credits ran at the end of old war movies. He silently recited their names, unable to escape the stomach twisting remorse. Other people had put it behind them, gone on with their lives. Why couldn’t he? His anguished reverie interrupted, with PX waddling along at his side, Harry went to the entrance and let the young reporter in. “Have a chair, Ronnie. Put the papers on the table. Be right back. Dog needs to go out.” In fact, Harry needed a moment to collect his thoughts, to settle himself. Left alone, Ronnie wondered if he should try again to learn more about Harry’s Vietnam days. Even a few lines would nicely wrap up the story he planned to turn in on Monday. From where he sat in the small living room, Ronnie could see into Harry’s office. The shadow box captured his attention, as did the photos. He heard Harry outside urging the dog to do her business. Ronnie stepped over to the office door and peered in. First he eyed the recruit company photo, dated March, 1969. Then he scanned the individual photos. Naturally Harry had been much younger, but Ronnie assumed the Marine in the picture had to be him. Someone had scrawled a place name across the bottom: Khe Sanh. The kitchen door closed and Ronnie retreated into the living room. Harry said nothing, making a show of perusing the sketches of the memorial site. “That’s my private office. You’ve run your errand. Now I have some things to do,” Harry said and, with an open hand, ushered Ronnie to the door. “Can’t you at least tell me what years you were over there?” Ronnie was determined not to come away with nothing. When he returned home, Ronnie opened the library book he’d started, following up on Satterfield’s recommendation to learn more about Vietnam. After all, Veterans’ Day was only weeks away, and it didn’t look like Harry Stone intended to give him a story. The book was Stanley Karnow’s Vietnam: A History. Ronnie had read only a few chapters, so he looked up Khe Sanh in the index (it was spelled Khesanh there) and skipped ahead. The account of the siege took up just a few pages, but Ronnie realized the Marines had withstood persistent attacks and taken heavy casualties in one of the great battles of the war. And to think Harry Stone had survived it. That was really something. Ronnie wished he could at least mention it in his story. But, Stone had been adamant--no interview. On Monday morning Ronnie paced back and forth waiting for Satterfield to get back to the office from a Chamber of Commerce breakfast. Brushing his teeth that morning, Ronnie had experienced an epiphany--the photos and Harry’s words, lodged there since the night before, had coalesced in his mind--with certainty. Now in Satterfield’s office, clutching the Karnow book in his hand, he brimmed with excitement--his first scoop. “Good. That’s what we hired you for.” Satterfield sat down at his desk and snipped the end off a cigar. “What if I told you Harry Stone is a liar, a phony? Ronnie spoke with all the gravity of a judge passing sentence on a felon. “Because he told me he was in Vietnam from 1969 to 1970. The siege at Khe Sanh was at the start of 1968. Right here in this book.” Like a prosecutor offering Exhibit A, Ronnie placed the book, open to the Khe Sanh narrative, on Satterfield’s desk. “Well, don’t. First rule of being a newspaperman is to confirm your information.” Satterfield sank back his chair and fiddled with a string of paper clips. He had long kept his doubts close hold, but Satterfield had himself from time to time wondered about Harry’s bona fides. Could Ronnie have it right? The young reporter had asked too many questions. And there was the damned memorial dedication. Oh, Harry realized he’d brought it on himself, but he had hoped it would never come to this. And when Satterfield called and asked if he could meet him for lunch at Millie’s, Harry asked himself if it simply meant one more appeal to show up on Veterans’ Day; after all, his name had been penciled in on the program? Not likely--Harry knew better. He knew what the editor probably wanted to discuss. Harry was in hot water and sinking fast. The first time Harry lied about his military service, it had been impulsive, indirect; he couldn’t bring himself to tell the truth, at least not the whole truth. It became easier over time, facts, wishes, and memories intermingled, molded and shaped like pieces of plastic. He’d assumed a persona that wasn’t entirely false, and after a time he’d begun to believe it himself. Others would have thought him a fool for feeling guilty at being alive, have thought he should count himself lucky. But, Harry’s greater guilt derived not only from his survival and his comrades’ deaths; it derived from the fact that, while others served, he had never set foot in Vietnam. Harry Stone was a fraud. The two men occupied a corner booth; it provided a modicum of privacy. Behind the lunch counter and in the kitchen the waitresses twittered like judgmental birds--Harry had not been in for a long time and now he looked, well, awful. Haggard from lack of sleep, his eyes red-rimmed. Harry stopped again, as if exhausted, covering his face with his hands. “Yes, go on.” Satterfield returned the fry to his plate. His face fraught with humiliation, Harry said, “What do you mean? Playing a role? I’m an impostor, Ted. Don’t you get it?” He tapped his chest. “In here I’ll always be a Marine. But, the fact is, I’m a God damned fraud.” Tears welled in his eyes. “Thanks for hearing me out. Tell the kid I’m sorry for the way I talked to him. Gotta go do some PT now.” With that, Harry Stone marched out of Millie’s Family Restaurant, leaving Ted Satterfield dumbfounded in his wake. The next morning, alerted by her whimpering, a neighbor noticed PX pressed against Harry’s garage door. When the man saw rags stuffed under the door, he rushed back into his house and called 911. Ronnie wrote the obituary. Harry Stone, long time resident of the Upper Valley and Vietnam era veteran (United States Marine Corps), died Thursday. The apparent cause of death was carbon monoxide poisoning. Mr. Stone was a twenty year employee at Valley Toyota and . . . Neither Ronnie Higgins nor Ted Satterfield mentioned Ronnie’s scoop to anyone. People would find out about Harry soon enough; but they wouldn’t hear it first from them.